This was my 9-5 during my weeklong summer vacation at Writing Camp: By day I wrote, shared work aloud with 11 other writers, and talked shop (mostly) during lunches around a large wooden table, our plates heaped with fresh salads, hearty breads, and nourishing entrees. But in a sense, for me the real work took place at night. After a bike ride, a swim, and dinner on the porch with my husband, I settled in with over-stuffed folders, journal entries, dream reports, notes and letters that dominate an entire closet in my office, and spill over into plastic storage bins in my basement. Although I’m on the minimalist end of the spectrum when it comes to home décor and possessions in general, my decades-long vocation with the pen has netted a heavy load (literally and psychologically) of paper. And now I felt ready to downsize. I may well have been influenced in this endeavor by the soaring popularity of Marie Kondo’s slash-and-burn approach to de-cluttering, and the more recent trending idea of “death cleaning”, which I interpret as de-cluttering with an eye toward what all of this stuff will look like to the heirs who’ll be charged with sorting through it later. So, each evening after my day of writing, I skimmed pages on which I’d tracked my psycho-emotional landscape through heartbreaks, and losses, small joys and triumphs. I preserved the occasional inspiring or illuminating paragraph as well as lines of inquiry or discovery that still piqued my interest. Also salvaged were amusing or revealing snippets of day-to-day life and memories that I thought my daughter would one day enjoy reading. Meanwhile, I filled brown paper grocery sacks with pages upon pages of mental mucking around. Clearing the literary equivalent of underbrush (tangles of insecurity, grandiosity, hope and despair) made space, it seemed, for the green shoots of well-earned wisdom, clarity, and purpose to stretch in the sunlight. And then at night I dreamed. One night, I dreamed I saw a rainbow through the window, which I took as a clear sign of the integration of my many selves and stories that I’d been reading through earlier that evening. And one morning I couldn’t remember any dreams, but I woke filled with joy. And when the week was over, I dreamed of a clear shelf, with a small packet of stapled pages sitting upon it. It was time, I now knew, to begin again. 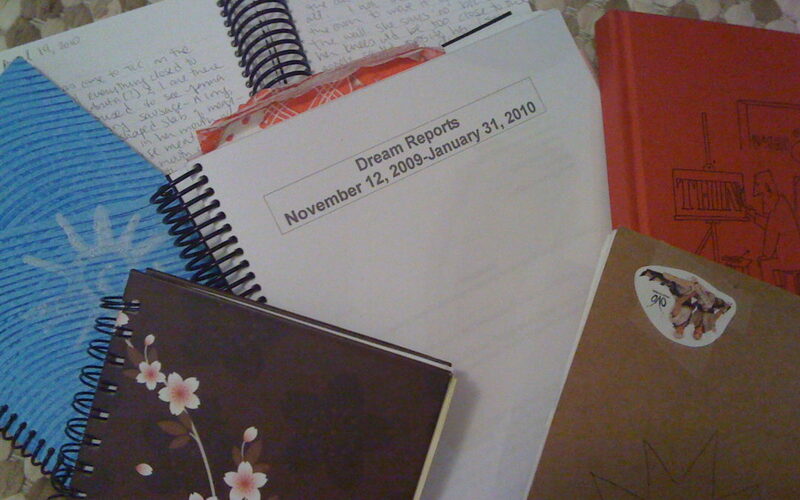 I wasn’t quite sure of my topic, but I knew whatever it was, it would emerge from what I had learned during that week of filling pages by day, sifting by night, and allowing my dreams to take care of the rest. restaurants over the years—or words. Letting go and clearing out creates space for something new and fresh. Dreams are de-cluttering masters we can learn from. Like any good writer, the dreaming mind both spins out stories, and clears out what’s no longer needed. Dreams are, after all, part of a cycle of sleep that helps consolidate memory by discarding what’s not salient and cataloguing the rest. So, even while they support the dreamer with journal-worthy inspiration and helpful guidance along the way, dreams also model for us the balance between hanging on and letting go.